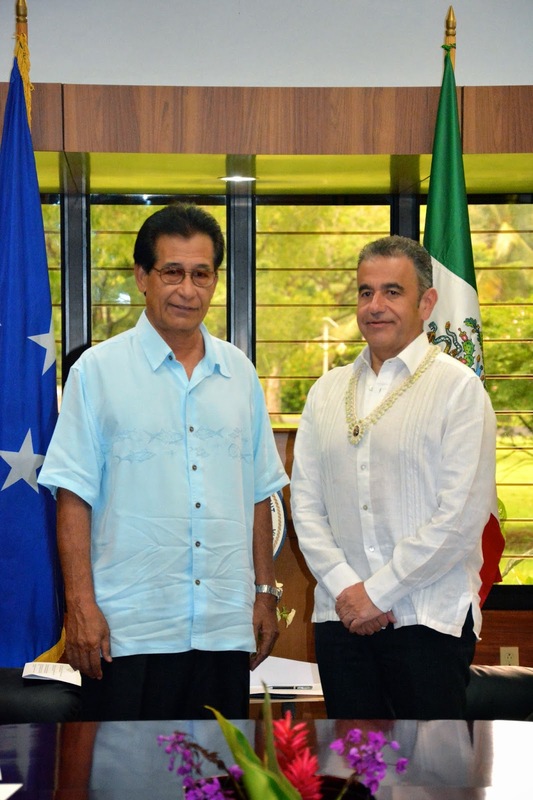 On August 25, 2014, Federated States of Micronesia (FSM) President Manny Mori received Mr. Julio Camarena-Villasenor who presented his Letters of Credence from President Enrique Pena Nieto accrediting him as Ambassador of the United Mexican States to the FSM. President Mori welcomed Ambassador Camarena-Villasenor to the FSM and expressed his appreciation for the shared interest in keeping a strong relationship between the FSM and the Mexican States. Ambassador Camarena-Villasenor thanked President Mori for accepting him and expressed his country’s readiness to connect FSM and Mexico together in diverse ways that will further solidify diplomatic ties between the two nations. Among an array of interests discussed, the Ambassador highlighted Mexico’s willingness to waive visa requirements for FSM citizens traveling to Mexico as a way of deepening interactions. President Mori welcomed this prospect and said the FSM should reciprocate this offer. The two officials also touched upon Mexico’s experience of economic success with the Ambassador sharing insights on his country’s interest in boosting air transportation services to the Asian region through Micronesia to maintain strengths in its tourism sector. President Mori pointed out that air transportation has been an outstanding challenge for his country, which can catalyze economic growth once resolved. In this connection, he encouraged collaboration to make this interest an eventual reality with benefits for both partners. Ambassador Camarena-Villasenor also spoke of education opportunities for FSM college students, which will require the knowledge of Spanish language. He also offered as an option training of FSM young professionals in foreign services as well as training opportunities in agriculture and tourism trades. In concluding the ceremony, President Mori asked the Ambassador to convey his regards to President Enrique Pena Nieto and said the FSM will continue to collaborate with Mexico in the international arena. He also stressed his desire for Mexico to partner strongly with the FSM in climate change matters as the most critical and urgent challenge of modern times. The Ambassador had served as the Undersecretary of Foreign Affairs for Management, Budget and Legal Affairs. He had been a professor in Political Science and International Law at the International University of Mexico. Aside from speaking Spanish and English, the Ambassador also speaks French and Italian. The new appointed Ambassador replaced Tomas Javier Calvillo Unna who served the FSM since January 2012. On August 21, 2014, a five-member delegation from Japan, consisting of officials from Sophia University as well as distinguished members of the Japanese Association for the Promotion of International Cooperation (APIC) visited the Federated States of Micronesia President Manny Mori in Palikir. President Mori welcomed the delegation and expressed his appreciation for the opportunity to meet with them and discuss matters of mutual interest and benefit in the education sector. President Mori acknowledged Japan’s increasing investment in the FSM with potential impacts in stimulating the economy and welcomed the new collaboration in the education sector. The President also spoke of his interest to visit Sophia University in response to its invitation for the President to speak at the University and to receive an honorary doctorate degree during his trip to Japan later in November. Mr. Takashi Hayashita, President of Sophia University, thanked President Mori for receiving the delegation and his support for the university’s initiative to establish a new collaborative relationship with the College of Micronesia-FSM (COM-FSM). He then confirmed the university’s plan to confer an honorary doctorate degree on President Mori in recognition of his strong leadership in deepening further the bilateral relations between Japan and the FSM. Mr. Hiroshi Yamamoto, President of Sophia University Junior College (SUJC) followed suit in speaking about the college’s goal in establishing a new friendship with COM-FSM. He said that a Memorandum of Understanding (MOU) between SUJC and COM-FSM is being drafted for signature by the institutions, which will allow students from SUJC to take an English language course at COM-FSM and learn from the rich cultures and history of Micronesia. Sophia University has already started a new scholarship program for Xavier High School graduates through which a graduate each year will be selected on merit to study at Sophia University. A student has been selected for school year 2014-2015. Wrapping up the meeting, President Mori recognized the important contribution that the Association for Promotion of International Cooperation (APIC) has made regarding the establishment of the new scholarship for Xavier High School and the new initiative between Sophia and the COM-FSM. He thanked former Japanese Ambassador to FSM Shoji Sato who is a new member of APIC for his strong support for these new initiatives. Besides Ambassador Sato, the visiting group included Mr. Takashi Hayashita, President of Sophia University and also professor of Science and Technology, Mr. Hiroshi Yamamoto, President of Sophia University Junior College, Mr. Megumi Araki, Director of APIC, and Mr. Yoshihiko Miwa, Director of the Office of General Affairs. The Micronesian Registration Advisors, Inc. (MRA) played a key role in arranging the visit and meetings with government and College officials for the group. In this connection, former FSM Ambassador to Japan Kasio Mida, senior MRA executive in Pohnpei, was also present at the meeting with President Mori. UNITED NATIONS, New York, 12 August 2014 - On International Youth Day, UNFPA, the United Nations Population Fund, and Global Citizen are launching #showyourselfie, a global campaign to urge world leaders to prioritize the needs and rights of young people in the post-2015 development agenda - the roadmap for the world’s development over the next 15 years. “Young people were not in focus in the Millennium Development Goals, the last global development plan that was adopted in 2000. They cannot be forgotten again,” said Dr. Babatunde Osotimehin, UNFPA’s Executive Director. “Young people are a powerful force, individually and collectively. They are shaping social and economic realities, challenging norms and values and building the foundation of the world’s future. How we meet their needs and aspirations will define the world’s future,” he continued. There are 1.8 billion young people in the world today - more than ever before. Yet, millions of them, especially girls, lack access to basic needs, such as education, health services, comprehensive sexuality education, decent work and protection from violence. More than 500 million young people live on less than $2 a day, and nearly 175 million of them in poor countries cannot read a full sentence. Some 74 million youth aged 15-24 are unemployed. #showyourselfie is a petition with a difference. Every selfie is a visual signature. The campaign seeks to mobilize millions of young people and their supporters to tell decision makers across the world that young people must be at the centre of plans that will shape our future. “#showyourselfie is a way of bringing young people, civil society, the private sector and governments together to amplify the call for the rights of young people to be at the centre of national priorities around the world. If we fail to confront this now, there is a huge risk that some of the world’s most pressing challenges will not be addressed,” said Hugh Evans, Chief Executive Officer of Global Poverty Project. Starting today, people around the world are encouraged to take and submit a ‘selfie’ via twitter, Instagram or the website www.showyourselfie.org. The campaign will collate the personal portraits and stories and present them to decision makers as a massive display of public support for increased attention to and investment in the capabilities of young people, specifically in the areas of reproductive health, education and training for work and life. Over the next 13 months, UNFPA and Global Citizen will work closely with partners, networks and organizations to gather the “selfies” which will be handed over to Member States at the United Nations General Assembly in September 2014 and 2015 to remind them that the time to invest in young people is now. For more information about #showyourselfie, please visit www.showyourselfie.org. UNFPA, the United Nations Population Fund, is the lead United Nations agency for delivering a world where every pregnancy is wanted, every birth is safe, and every young person's potential is fulfilled.UNFPA expands the possibilities for women and young people to lead healthy and productive lives. It works in more than 150 countries and territories, home to 80 per cent of world population. In these nations, the Fund is a catalyst for progress. Working with governments and through partnerships with other United Nations agencies, civil society and the private sector, it makes a real difference in the lives of millions of people, especially those who are most vulnerable. For more on what it does, visit www.unfpa.org, “like” UNFPA on Facebook and follow it on twitter and Instagram @UNFPA. Global Citizen: Launched successfully with the Global Citizen Festival on 29 September 2012, in New York City’s Central Park, Global Citizen is an innovative online platform and mobile application that educates, tracks and rewards activist action through a point-scoring system. Accumulated points are used as a currency to enter the draw for live entertainment experiences like tickets to great concerts and a host of other entertainment events. Ryan Gall and The Riot House are co-founders of Global Citizen. Join the conversation: visit its website at globalcitizen.org, "like" Global Citizen on Facebook, and follow it on Twitter and Instagram at @GLBLCTZN. FSMIS (August 4, 2014): The Forty-Fifth Pacific Islands Forum Leaders meeting concluded in Koror, Republic of Palau on July 31st, 2014. The meeting was attended by the Federated States of Micronesia President Manny Mori and other Heads of State and Government from the Republic of Kiribati, the Republic of Nauru, Niue, Palau, Papua New Guinea, Republic of the Marshall Islands, Samoa, Solomon Islands, Tonga and Tuvalu. Australia was represented by its Deputy Prime Minister while New Zealand and the Republic of Vanuatu were represented by their respective Ministers of Foreign Affairs. The Cook Islands Minister of Finance represented his country. As Associate Members of the Pacific Islands Forum, the French Polynesia and New Caledonia attended the formal session and were given opportunities to address the Pacific Leaders. Other governments and organizations also attended the session as Observers including Tokelau, Timor-Leste, Wallis and Futuna, the Asian Development Bank, the Commonwealth Secretariat, the United Nations (UN), the Western and Central Pacific Fisheries Commission (WCPFC), and the World Bank. Also, some Heads of Organizations and senior officials from the following groups were at the formal session: The Council of Regional Organizations of the Pacific (CROP); The Pacific Islands Forum Fisheries Agency (PIFFA); the Pacific Islands Development Program (PIDP); the Secretariat of the Pacific Community (SPC); the South Pacific Tourism Organization (SPTO); the Secretariat of the Pacific Regional Environment Programme (SPREP); and the University of the South Pacific (USP). Based on presentations and discussions undertaken at the formal plenary on July 30th and decisions agreed upon at their retreat in Peleliu, Palau a day later, the Pacific Leaders issued an outcome Communiqué that details the collective actions for short and long term regional focus. Following decisions made at a special retreat on May 5, 2014 in the Cook Islands, the Leaders endorsed the renewed Pacific Plan calling for strong partnerships and well-defined principles fostering inclusivity and regionalism. They also affirmed the important roles the CROP agencies play in relation to the Framework for Pacific Regionalism and directed the Forum Secretariat to ensure higher transparency and efficiency of meetings. In view of the Post 2015 Development Agenda and the Sustainable Development Goals (SDG's) being discussed at the global level, the Pacific Leaders expressed concern regarding the number of goals and targets and called on the global community to focus on limited number of SDG's and make the agenda more achievable. Given the concern and other needs, the Leaders looked forward to the upcoming Small Islands Development States (SIDS) international conference in Apia, Samoa in September 2014 as a platform for unified interventions by the Forum Island Countries (FIC's) to affect global development agendas and ensure the inclusion of Ocean Sustainable Development as a stand-alone goal to be emphasized under the post-2015 global SDG's. The Leaders also endorsed the Palau Declaration on 'The Ocean: Life and Future' as a document by the PIF Leaders. This declaration stresses the importance of the ocean to Pacific people, enumerates the existing threats and dangers facing and faced by ocean populations, and emphasizes the need for integrated management approaches for sustainable utilization and conservation of marine habitats and resources. The Leaders also undertook actions and provided direction on the treatment of issues relating to the threat of invasive species on Pacific economies and communities, Fiji's readmission to the Forum, Regional Assistance Mission to Solomon Islands (RAMSI), Transnational and Boarder Security Issues, Radioactive Contamination in the Republic of the Marshall Islands, and Private Sector Dialogue in the region. Additionally, the Leaders agreed to accept Tokelau's application for Associate Membership in the Forum and admitted the International Organization for Migration (IOM) under Observer status. Spain and Turkey were also granted membership in the Post-Forum Dialogue (PFD), which took immediate effect at the August 1st meeting between Partner countries and the PIF Member-States. After six years of leading the Forum Secretariat, Leaders expressed their appreciation to Mr. Tuiloma Neroni Slade for his significant role in the strengthening of the region the past six years. To replace Mr. Slade, the Leaders appointed Mrs. Dame Meg Taylor of Papua New Guinea as the new Forum Secretariat Secretary-General for a three year term, beginning in November 2014. As confirmed, future PIF Leaders Meeting will be held as follows: Papua New Guinea in 2015; the Federated States of Micronesia in 2016; Samoa in 2017; Nauru in 2018 and Tuvalu in 2019. The opening of the first day of the Pacific Islands Forum Leaders meeting in Koror, Palau, July 30, 2014. Held once every four years, the 8th Micro Games came to an end on Wednesday July 30, 2014 at the Pohnpei Island Central School (PICS) track & field, as it closed off with good cheer and spirits among athletes and a crowd of sporting fans as they gathered to witness the closing of the multi-sports games. Coming in at 1st place is Guam, raking in a total of forty-two gold medals, Pohnpei thirty-six gold medals following Palau with thirty-six gold medals. Pohnpei State Governor Ehsa shared a few remarks, congratulating all participating athletes for competing on a regional stage and for their great sportsmanship. With Pohnpei having the honor of hosting yet another remarkable event, the host nation is in the midst of seeing most of its athletes return to their respective nations. In the meantime, Yap prepares for a crowd of sporting fans that will flock to the state for the upcoming 9th Micro Games in 2018.